With his debut novel, Rich and Pretty, Rumaan Alam has earned himself a place in the Barnes & Noble Discover Great New Writers Program, a select group of authors the bookseller picksto introduce new writers to the reading public. 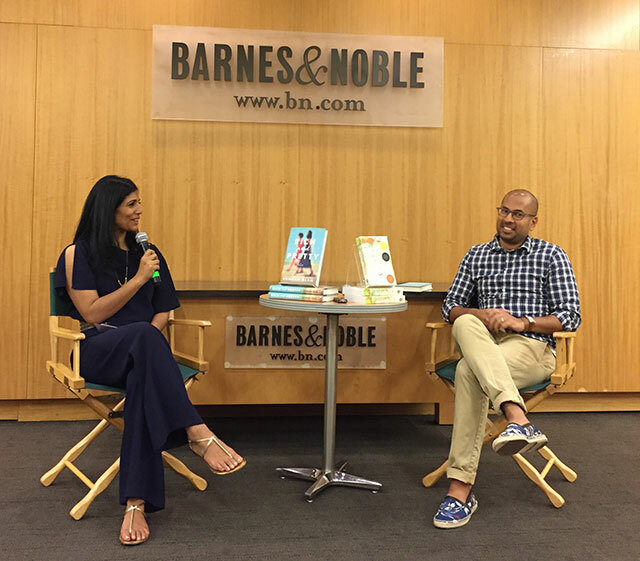 Alam discussed the book at B&N’s 86th Street location and with Mira Jacob author of The Sleepwalker’s Guide to Dancing. Rich and Pretty is the story of two young women who grew up as close friends who have grown apart. The novel follows their lives as Sarah’s wedding approaches. Mira Jacob begins by jokingly asking Alam how many women’s brains must he have eaten in order to have gotten so deeply inside the female mind. When you are writing something that doesn’t belong to you, you have to be cautious, Alam says. Every person in publishing is a woman; he felt if he fundamentally was wrong about women and their friendships, they would have caught it. The novel was vetted by women. There is an expectation of writers of color and women that their writing is going to be autobiographical. He adds that he doesn’t think anyone says Purity is the story of their life in the way it’s often said of the narratives by marginalized groups. Alam calls it the curse of being a minority artist. He says during the writing of the book, he thought about the characters all the time. He would walk around the city and think about how they would interact with things and people he encountered. Writing was devoid of joy, but it was an escape. However, during much of the process he often believed he would never finish writing it. He describes writing the novel as though he was in a trance or a fugue state. “I’ve always been suspicious of writers who say they love writing,” he says.